Stores reference 22c/827. The frame is generally in very good '+' condition with only minor paint loss/chipping. The leather surround is equally good and the backing chamois much cleaner than most pairs. Unusually the internal padding remains soft and pliable. Very good nosepiece leather. The tinted glass lenses have delamination marks and the right has a small crack. They do let the goggles down a bit although they display reasonably. This pair of goggles is fitted with the rarer early NEWEY leather strap which is in excellent condition. They are also fitted with the extremely rare and sought after celluloid acetate 'flipshield', or more correctly, 'Screen, anti-glare', stores reference 22c/836. This has minor scuffs/scratches and the metal attachment clip has surface corrosion. 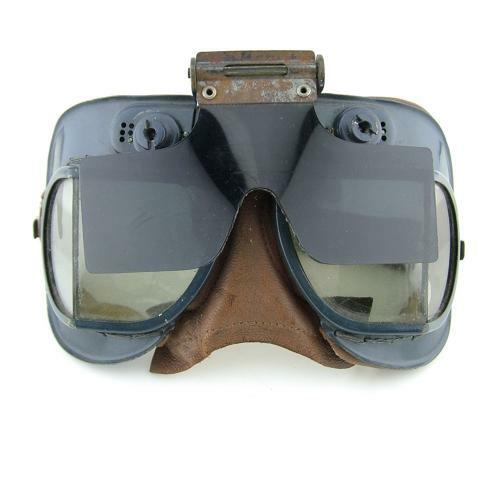 A very good '+' pair of goggles suitable for both RAF and USAAF displays. Upgrade the lenses to make an excellent pair. Stock code G19232.